I posted a couple of parasitized aphid “mummy” shots in the macro forum. This post illustrates the setup I used for those shots. This is a setup I frequently use to shoot image stacks of still subjects. 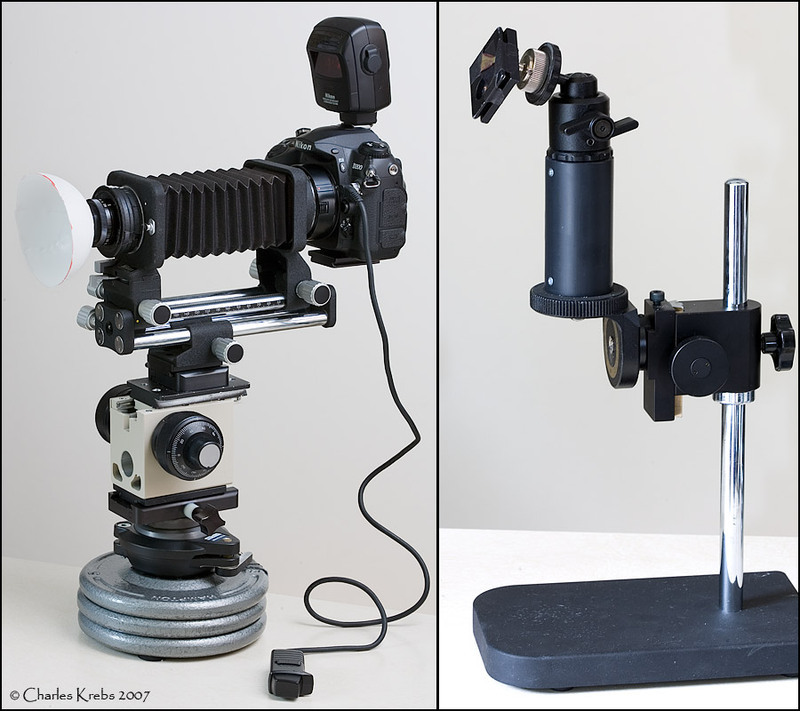 The tabletop setup used consists of two primary components… a “stand” for the camera and a “stand” for the subject. The upper image below shows these components. The subject stand (right half) is quite versatile as the subject platform can be raised or lowered and rotated to just about any position via either the stand pole or the small ball-head. The entire piece can be slid around the tabletop. Three 5lb barbell weights were glued together to provide a solid, heavy, base. (Small plastic tabs attached on the bottom allow it to be slid over the tabletop without scratching the surface). Above that is a leveling attachment… this allows some left/right and forward/backward tilt capability. 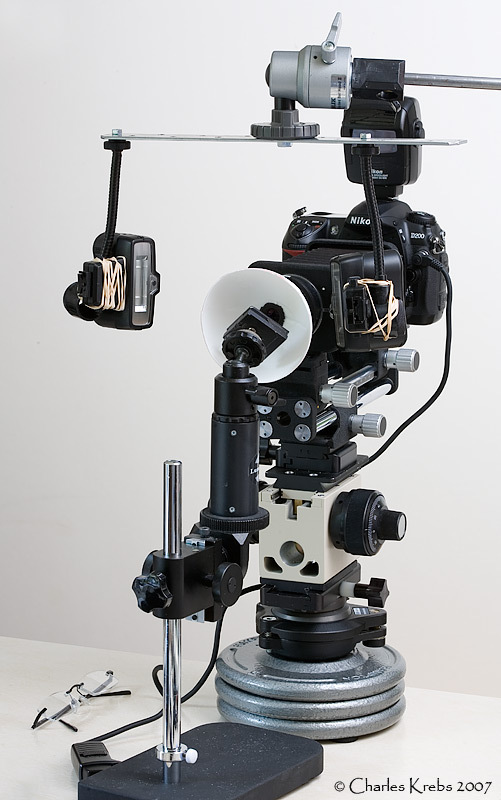 Above that, attached via Arca-Swiss style clamps and plates, is a focus block from a large Olympus “stand” microscope. The fine focus of this mechanism is what is used to move the camera when shooting image stacks. Then comes a Nikon bellow unit with the D200 attached. On front is a 35mf2.8 Canon micro lens, which has a diffuser (made from a whiffle-ball) attached to the front. In the camera hot shoe is a Nikon SU-800 Wireless to control some of the flash units used. While this tall combination looks like a recipe for vibration nightmares, the techniques I use for actually taking the images eliminate any problems. There are two approaches I use. If incandescent (continuous) light is used for exposure, it is adjusted so that my exposure times are 2 to 4 seconds in duration. I always use mirror lockup, and any vibration caused by the shutter mechanism quickly damps out at the beginning of the exposure. So effectively, the vast majority of the exposure takes place with everything perfectly still. (All “hardware” connections are metal-to-metal with no cork or rubber anyplace. I’m sort of surprised at how stable it actually is). Camera shutter is manually set to one second. Prior to taking the pictures, the ambient light (continuous) is lowered so that no image (or at least a hardly perceptible) image is registered at the 1 second exposure time. The camera flash sync is set to “second shutter curtain”. Mirror lock-up is used, and the flash units are turned on and used at manual settings. When used this way you can be assured of really vibration free results. The mirror is first pre-released. After a pause, the one second exposure begins. By the time the flash fires at the end of the one second exposure everything is dead calm. (This may actually be vibration-reduction “overkill”, but it is easy to do and extremely effective). Since I want the flash units to be fully recharged before the next shot, the time delay between shots works out nicely. (When you use flash to shoot a “stack” you should use a manual flash mode and allow enough time for the flash to recycle to be sure you are getting the same exposure with each frame). The lower image shows this as they were set for the aphid shots. What is not seen in this shot is that there was a large, slave-fired electronic flash directly overhead pointed down onto the top of the diffusion hemisphere. When the picture is taken, the SU-800 fires two small Nikon SB-R200 flash units on either side of the diffuser. (This also triggers the large slaved flash above). Power levels on all flash units can be adjusted to get different effects. If a unit is positioned very close to the diffuser (as is an SB-R200 seen here) the area of the spherical diffuser that is illuminated can be small, and it is possible to get a soft shadow effect (depending on the power setting of the other flashes). I hope this doe not seem hopelessly complicated. The reality is this could all probably be done equally well with a much simpler arrangement. But I’ve been “collecting” many of the bits and pieces seen here for over thirty years so I just grab and assemble them as I need. This particular arrangement has proven extremely versatile, but with that versatility comes a bit more complexity. Charlie, you have made my entire week with these photos. At first glance, yes indeed, the setup does seem a bit complicated. But on careful study I can see how and why every part of this contraption is in there, and it warms my heart to see that Uncle Rube still holds a position of respect and admiration in someone's heart besides my own. Spare parts cabinets are so handy! The way you're using that Olympus focus block is beautiful. How much total travel do you get with that thing? Yeah.. I started with the Olympus block bolted directly to the weights and the camera body attached directly to the Olympus piece. ... then I wanted the versatility of the bellows. The thing is that with a SLR I always take the shooting precautions described above, no matter how stable the setup seems. So while this particular configuration looks less than ideal from a vibration standpoint, vibration is really a non-issue given the shooting methods used. So I figure why not have the nice capabilities this arrangement provides. That piece has proven to be wonderful! It is from an Olympus BHMJ scope. The total travel is about 30mm (1.18"). The fine focus knob is calibrated... and you can easily make 1 unit moves (even 1/2 unit it pretty easy). Also, you can travel the full 30mm with the fine focus if desired... unlike some blocks where fine focus "travel" is limited. And it is smooth as silk! Just brilliant as always Charlie. Well worth saving this one. Which method do you find most appropriate for determining white-balance with this type of setup - with regard to the flash array? Different diffuser materials can definitely alter the color and color temperature, generally reducing it somewhat. To be honest I don't worry about it too much. Since I like to work from raw files I have just come up with a setting that seems to get the jpegs very close to where I want. With the diffuser I use most often, and the Lumedyne flash system I normally use, I think (not at my shooting location right now) that is a setting of 4800k. If I wanted to work solely from jpegs I would want to be more precise, but it would be a simple matter to take a shot of a "mini" white card and use that for a custom white balance setting. I do not leave it on "auto" white balance. Typically I will shoot a raw+jpg (often a small jpg). Usually there are several slightly different shots (stacks) made of each subject, with slight variations between them. Then I will do quick runs in the stacking software using the jpgs. When I find the stack that I really like best, I can then just convert only the needed raw files, and devote my energies to that particular image. I found that if I left it on "Auto" white balance with my D200, I would occasionally see some color variations in the jpegs in different images in the same stack. This has no effect on the raw files, but it was not desirable for making the jpeg stacks. A recent thread got me thinking of this “sticky”. Looking at some of the current member’s set-ups is awe inspiring. Comparing my early efforts (pictured above) to some current arrangements makes me think of a comparison between the Wright Flyer and a B-2 Stealth Bomber. While the search function of this forum is quite good, it can be tricky to find all the nice info tucked away in posts. There are a couple of places where this info has started to come together (first two links below). Since this post has “sticky” status and gets a goodly number or “reads”, I thought it might be useful to place links here to some of the “hardware” and set-ups that are used. Except for the first two, these are not in any particular order. There are undoubtedly others that are valuable in this regard, and I apologize for the ones I might have missed in this first “group”. If you are aware of other posts that illustrate the actual nuts-and-bolts we use, please add them. Lots of great ideas here… thanks to all those who have posted their endeavors! I especially like the olympus focusing block. I see that microscope focusing blocks get a lot of interest and bids on ebay. I saw a pretty nice old Zeiss Universal microscope left unbid on in the UK for 99cents. My god the thing was in beautiful condition on most of the parts but the objectives looked hammered. Just the x-y stage on the stage platform was worth a bid, let alone the focusing block, lower transmitted light stand and sub stage condenser lens. Darn, let that one slip away! Since I'm new to DSLR's, my experience lies with dedicated C-mount CCD camera's, Does the minor shutter vibration at the begining of a long exposure just become very negligable in terms of "blur"? You should look at the Canon line of dslr cameras that support silent mode. There is no mirror or mechanical shutter vibration with these when using silent mode. I use a Canon T2i where the silent mode is on by default when using live view. Make life much easier when shooting micro minerals. Doug - remember with most focusing blocks there's only a small travel with the fine adjuster. I only know of some Olys and Nikons which go the whole way. They ARE useful for height adjustment at least though, especially if the stage x-Y is there. But I wouldn't have been tempted by that one you saw, I have enough "bits"! I just tried out the Canon Rebel T3i the other day on my Zeiss stereoscope, Between the Z-Stacker & the EOS Utilities it was a breeze. I put the Horse/camera ahead of the Cart/manual before I realized there is probably no vibration in live view. I was just wondering about Charles technique of not worrying about a little vibration for a split second over a 30 second exposure...Makes perfect sense when you think about it. Also to Chris R, I'm kinda like someone who likes to collect certain things (and use them) some people collect shotguns, others nik naks, I have about a dozen microscopes of various ages and abilities. If I happen to be watching TV and a crime lab or medical lab comes on the program I'm always assessing their optics...It's a mild but enjoyable affliction. The Zeiss coarse fine focusing blocks are nice, now that I'm using Zerenne I need a couple of Z-axis fine motion. I just bought a z-axis micrometer stage on ebay last week- looking forward to it.